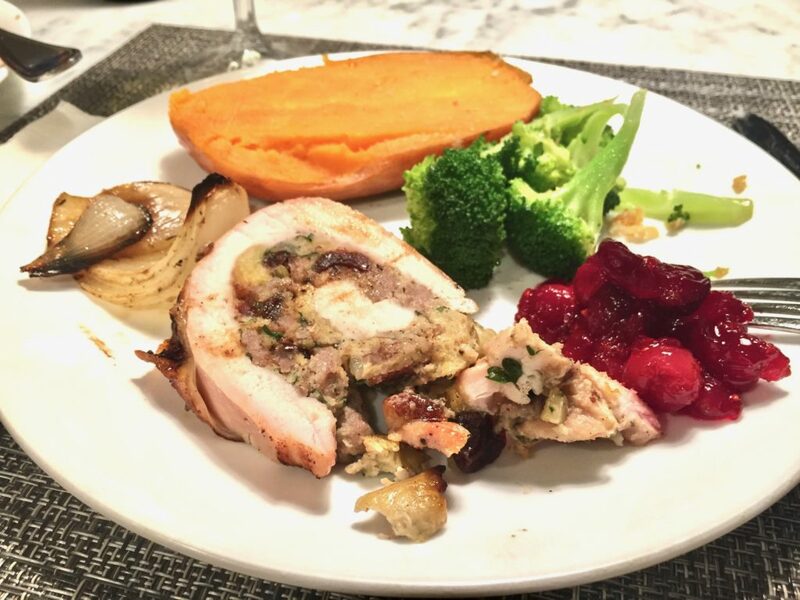 Maybe you’re “turkeyed-out” after the Thanksgiving holiday, but not me. I didn’t have the traditional bird on the big day. Instead, I was tempted by too many other offerings at Commander’s Palace, a landmark restaurant in New Orleans. My husband and I spent a few days in New Orleans during the holiday week, visiting relatives and expanding our waistlines. (Those of you who follow me on Instagram saw photos of lots of the food we ate, plus the wacky hats and costumes people wore at the racetrack on turkey day). 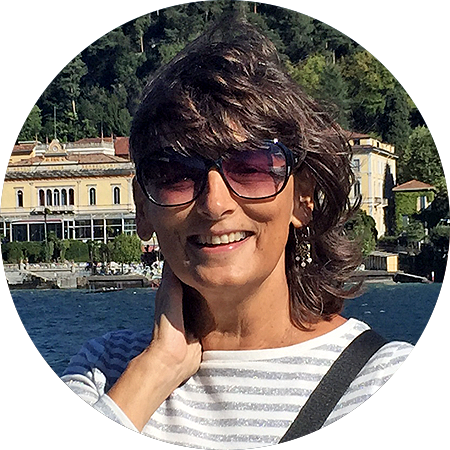 We ate so many delicious meals at so many wonderful restaurants each day, recommended by my husband’s son and wife, who moved there from New York a couple of years ago. As much as I love dining out, I also missed the smells and tastes of a good old-fashioned turkey dinner. 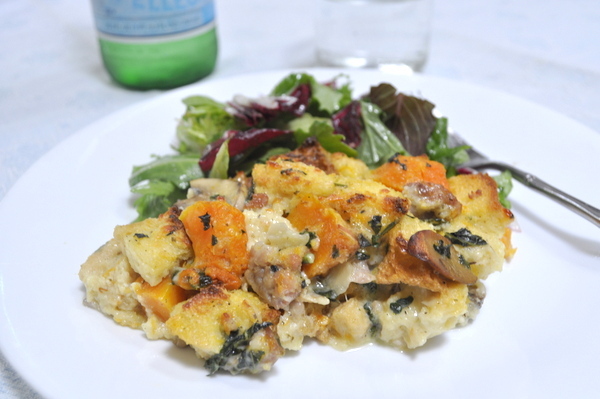 So after returning home, I restocked at the grocery store yesterday and made a scaled-down version of a Thanksgiving meal for the two of us last night. 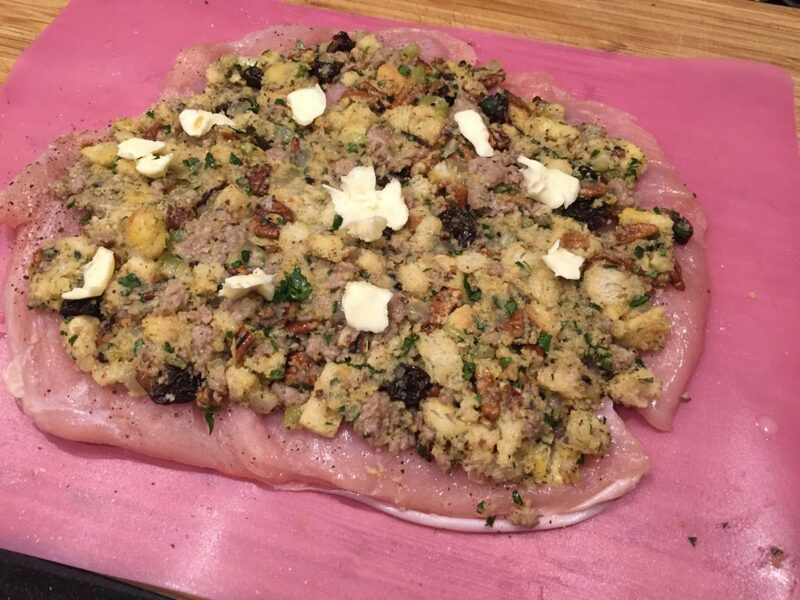 Instead of a full turkey, I bought a boneless turkey breast and stuffed it with a sausage/dried cherry/pecan stuffing. 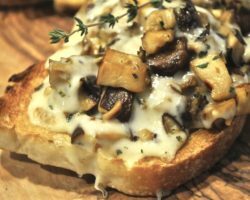 It was a lot easier to prepare than you’d think (and way easier than cooking a whole turkey) and would make a great meal for company around the Christmas holiday too. 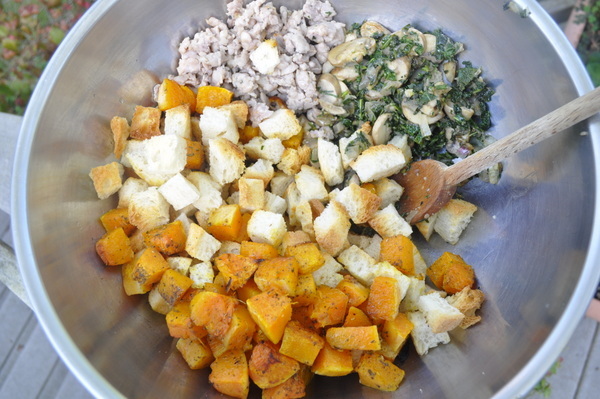 Start out by preparing the stuffing. 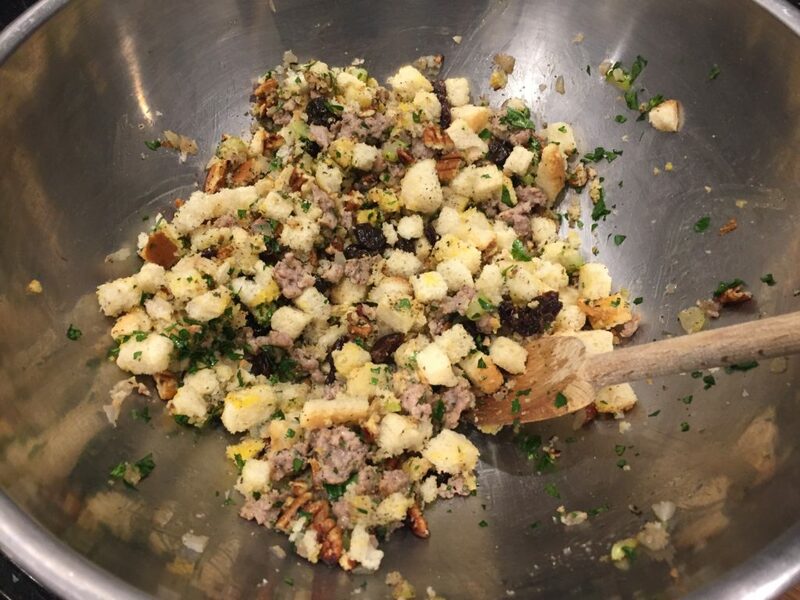 I used a mixture of bread cubes, cooked and crumbled Italian sausage, dried cherries soaked in rum, toasted pecans, eggs, plus some fresh herbs and spices. If you don’t like dried cherries, use whatever dried fruit you like – cranberries, apricots, or figs for instance.) Don’t like pecans? Then use walnuts, pine nuts or hazelnuts instead. 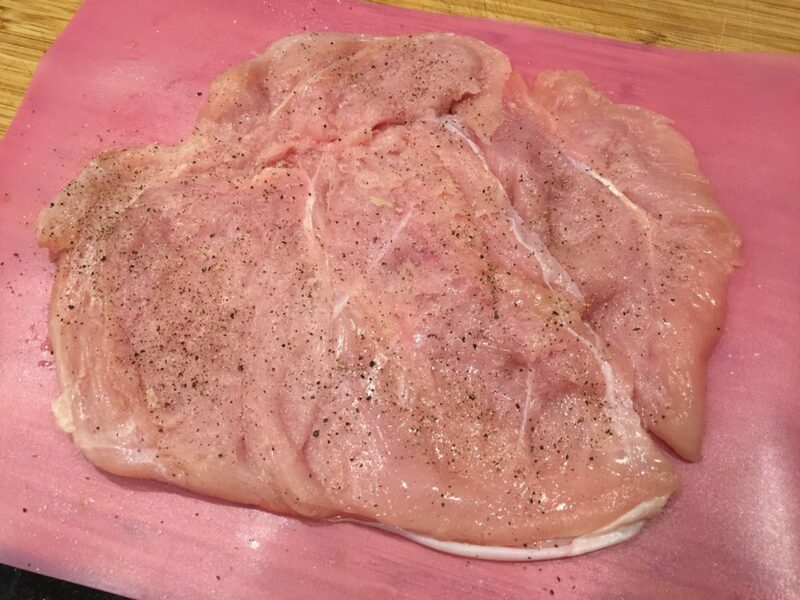 This is the turkey breast I bought. 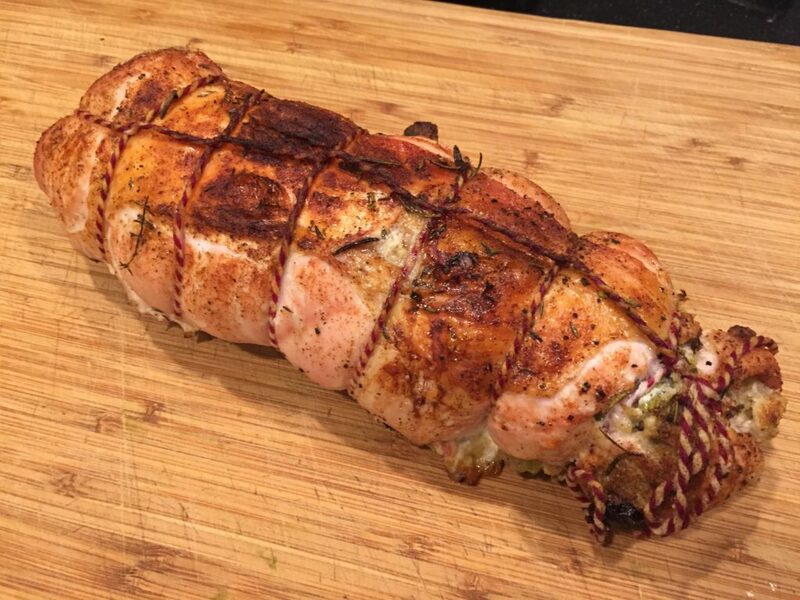 It was about 1 1/2 pounds and when stuffed, could easily serve four people (maybe five, depending on appetites). 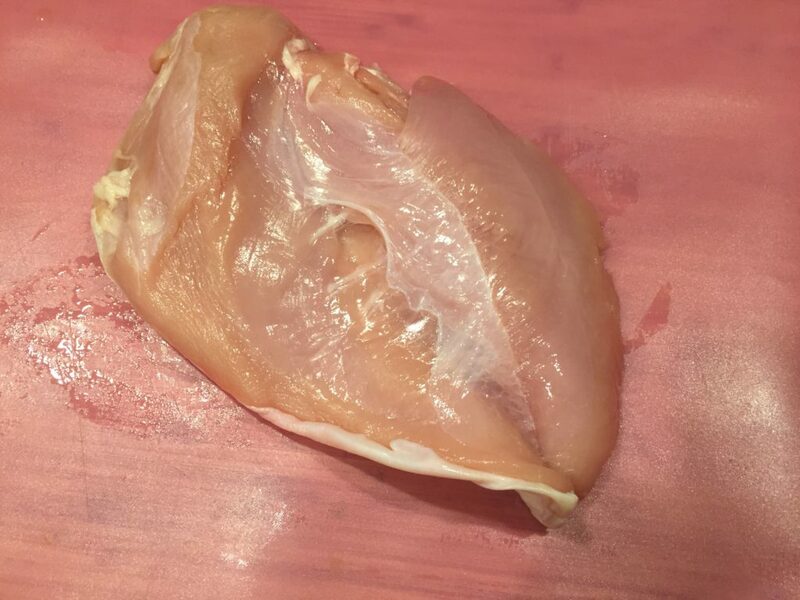 Make sure you buy a breast with the skin still attached. Here’s what it looks like when you flip it around. Obviously, it’s too thick to stuff this, so you have to do a little prep work. It’ll take you only five minutes to complete. 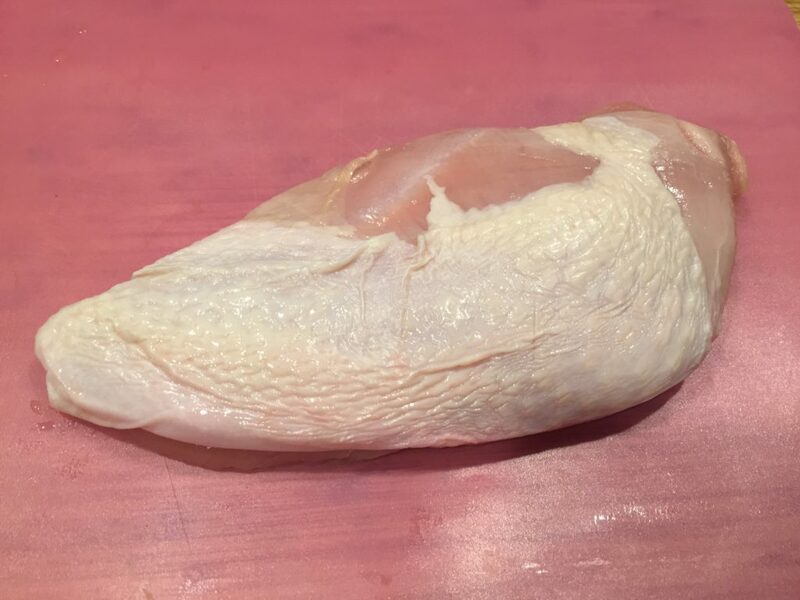 Slice the breast parallel to the counter surface, so that the meat opens like a book. It’s still too thick at this point, so use a mallet (first cover the meat with plastic wrap) and pound it flatter. This is how mine looked after pounding, and sprinkled with salt and pepper. 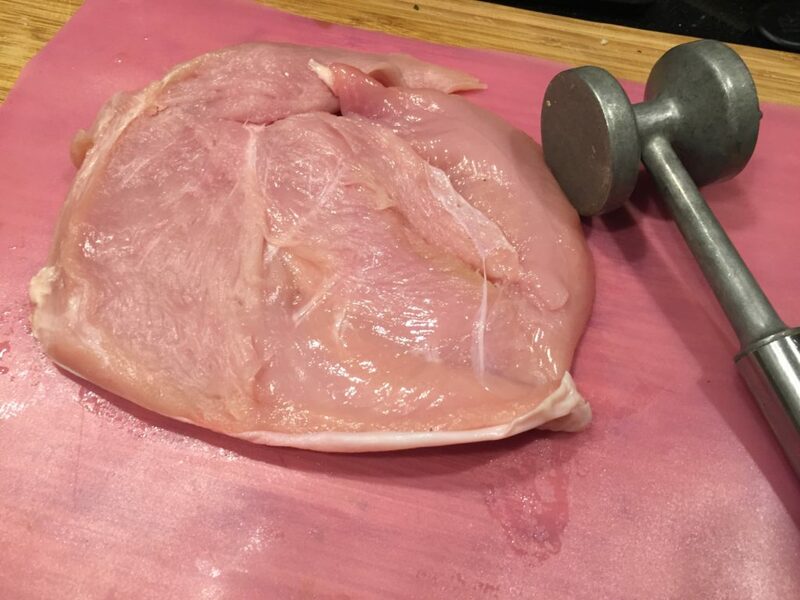 Be mindful that the skin that was on the meat before you started pounding it, will now be on only a small part of the meat after you’ve pounded it. Here you can see it sticking out at the bottom of the meat. So when you start rolling it up, start from the side that doesn’t have the skin. Spread the filling around the surface and dot with a little bit of butter. 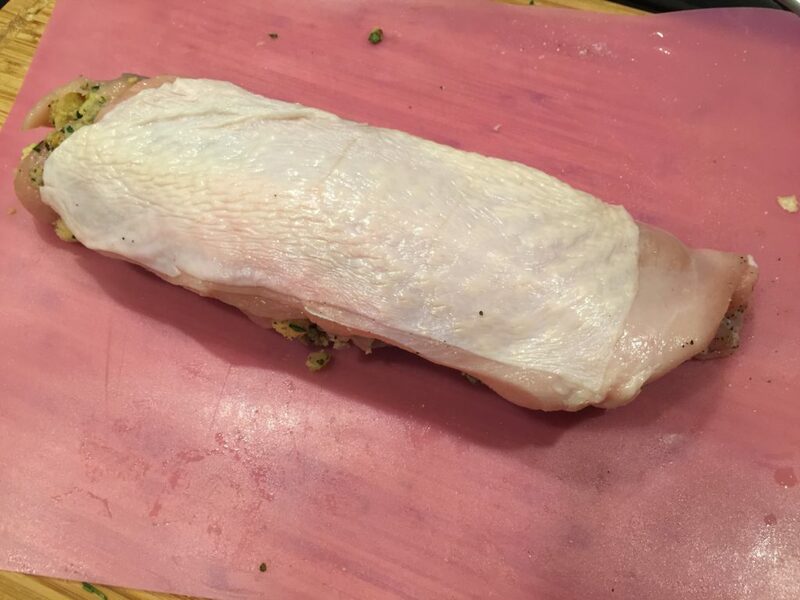 Roll it up, starting with the length of meat that doesn’t have any skin attached to it. 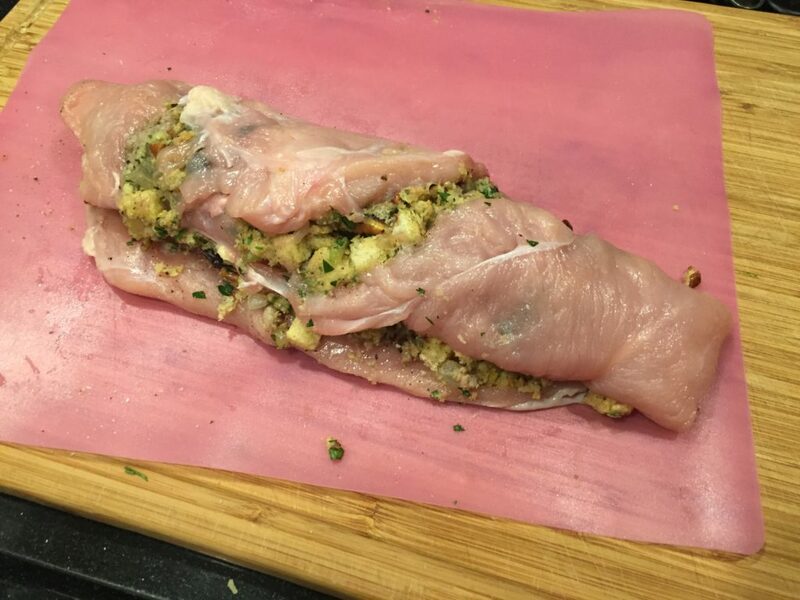 You’ll want the skin to end up on the outside, so if you started with rolling up where the skin is, you’ll have the skin inside the meat, which you don’t want. I hope that’s not too confusing. See, the skin is right where it should be when you flip it over. 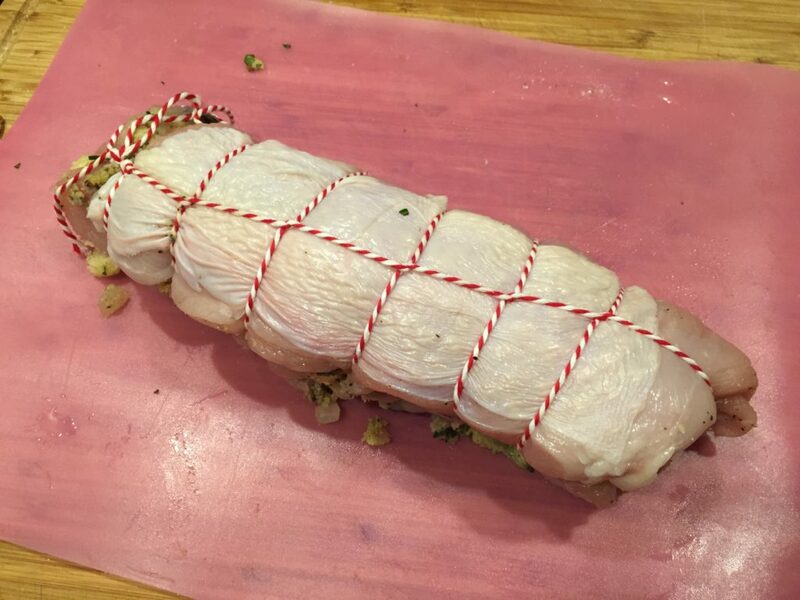 Tie it up well with butcher’s string so that it stays together when roasting. Then season with with salt, pepper, paprika, some thyme and rosemary (the fresh herbs actually burned midway through the roasting, so I’m not sure I’d do that again). Scatter some onions all around, then pour in some white wine (I would have added some chicken broth too, but I didn’t have any). 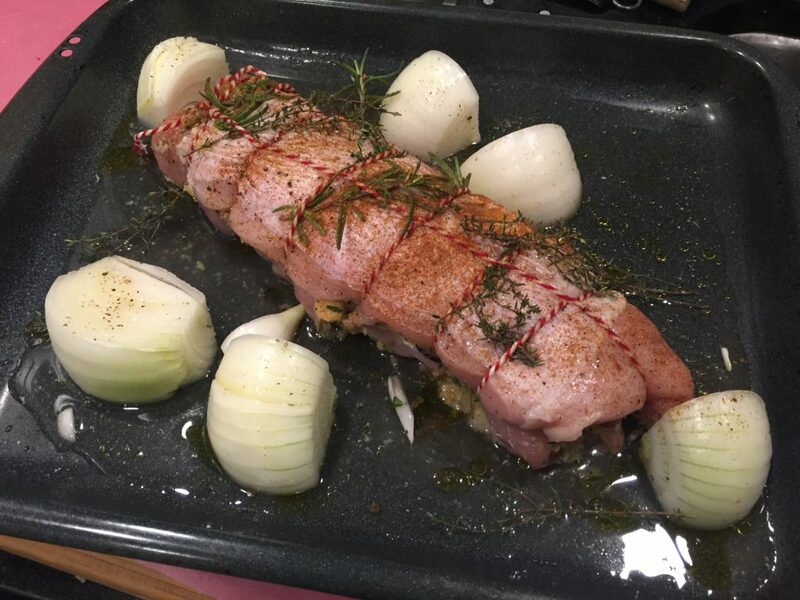 Drizzle some olive oil over the onions and the meat and roast at 400 degrees for about 50 minutes, or until a meat thermometer registers 150 degrees. Actually, when the thermometer reads 140-145 degrees, take it out, since it needs to rest about ten minutes and the temperature will continue to rise a bit when it’s resting. Remove the twine and slice. Enjoy! Happy Belated Thanksgiving. Hope you had a wonderful time with family and friends. 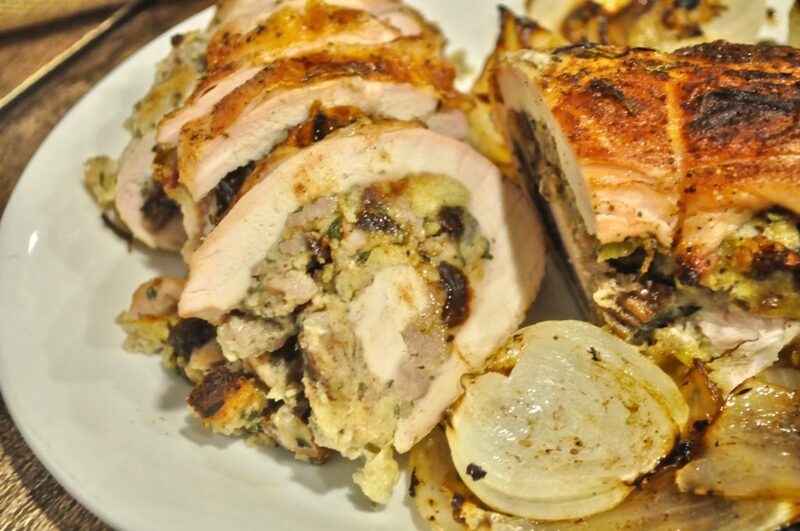 A boneless turkey breast, rolled and stuffed with sausage, pecans and dried cherries. Start by soaking the dried cherries in rum. Melt one tablespoon butter in a sauce pan and add the onions and celery. 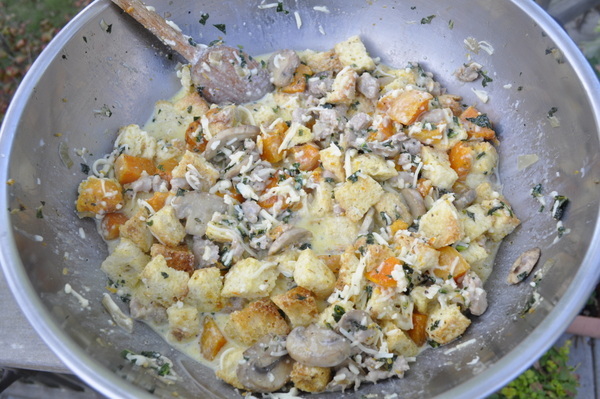 Sauté until wilted, then add the sausage and crumble with a spoon. When sausage is fully cooked, add it and the onions to a bowl. Drain the cherries from the rum and discard the liquid. To the bowl with the sausage, onions and celery, add the cherries, the bread cubes, the eggs, the toasted pecans and seasonings. Melt the remaining butter and add to the bowl and mix well. Slice the turkey breast open like a "book." Using a mallet, pound it flatter, using plastic wrap to protect the meat. Spread the stuffing over the meat , adding a couple of pats of butter. Roll up the meat, making sure you end up with the skin on the outside. Tied it with butcher's string to hold everything in place. Place in a roasting pan and roast at 400 degrees for 50 minutes to one hour, or until a thermometer reads about 140 - 145 degrees. The temperature will continue to rise for a short while and should reach 150 degrees. Let the meat rest, covered with aluminum foil, for at least ten minutes. 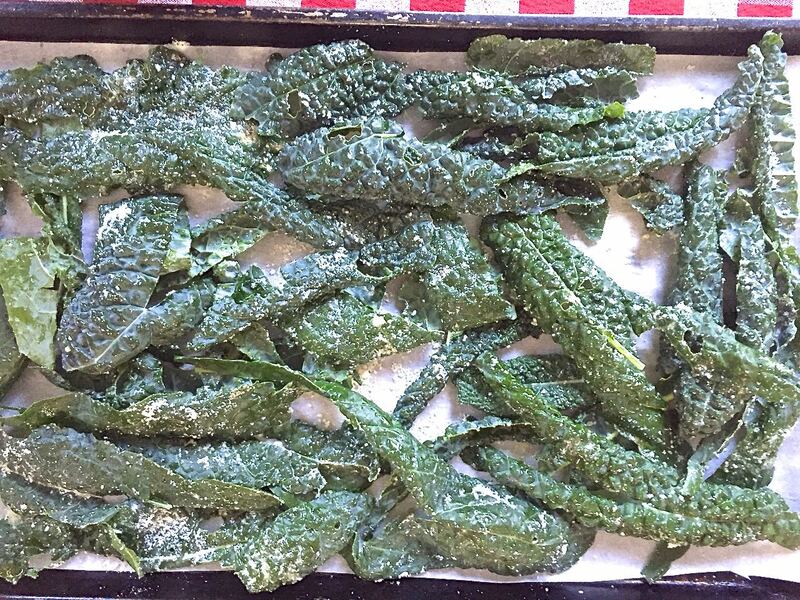 Is there anyone out there who hasn’t eaten kale? Who is still a kale hater? Let me help convert you. In the last few years, kale seems to have become the poster child for healthy eating. The benefits of eating kale include not only its high fiber content, but it’s also rich in nutrients and low in calories. Check out more of the health benefits on this website here. 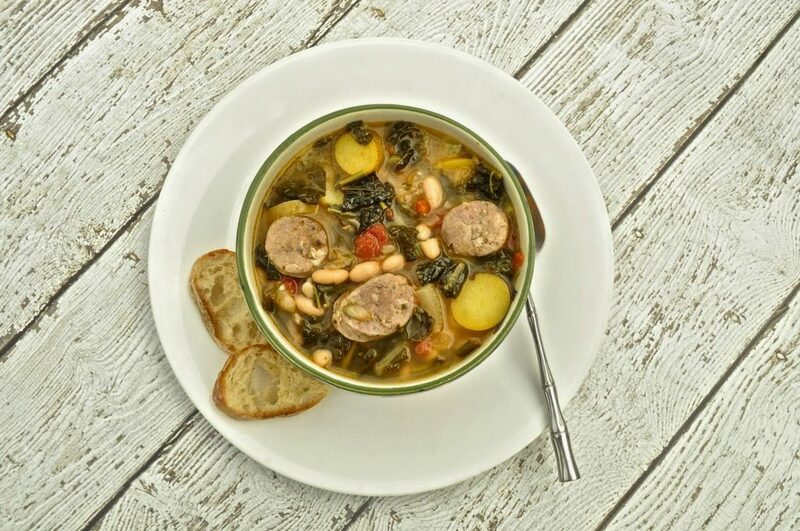 I admit I was late jumping on the kale bandwagon, and the only kale I grow in my garden is the lacinato or Tuscan kale (sometimes called dinosaur kale), which is called cavolo nero in Italian and is typically used in the Tuscan soup ribollita (recipe here). This dish of beans, sausage and kale is something I normally make with swiss chard or escarole, but I decided to try it with kale instead. While I still think Swiss chard has a sweeter taste, kale is perfect for this recipe since it stands up well to the longer cooking time required for the beans and it reheats without any loss of flavor. In fact, reheating only improves the taste. 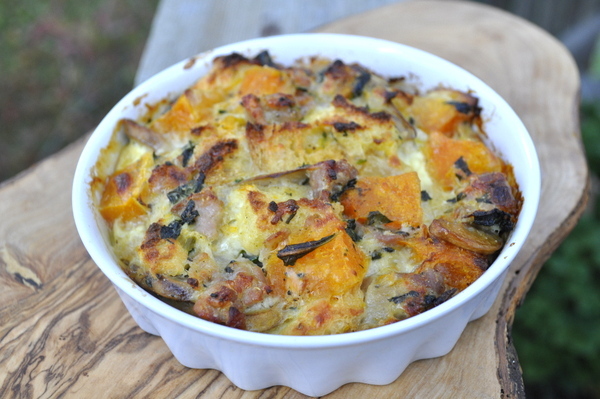 Even though it’s summer here, I’ve made this dish a couple of times because of all the kale growing in my garden. 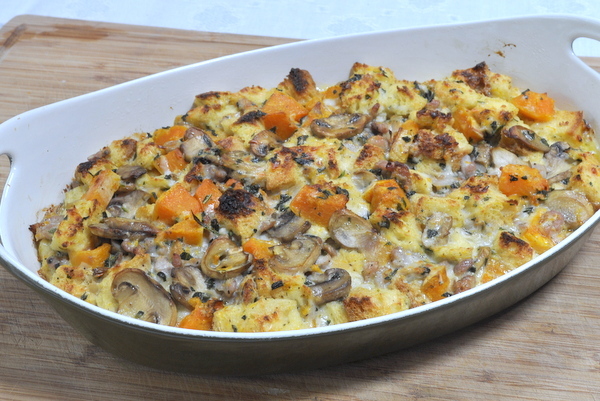 It freezes beautifully too, though, so make some for one of those cold winter nights when you don’t want to cook. I’ve used my kale in a couple of other ways this summer too. Maybe I’m the last person on this planet to try kale chips. I was inclined to dislike them, but everyone I served these too (and me too), thought they were delicious. They’re really easy to make and they’re a healthy snack alternative. I used a recipe from Ina Garten, aka, The Barefoot Contessa. Pull out the center rib from the kale, then spritz with some good olive oil, a shake of salt and a sprinkle of parmesan cheese. 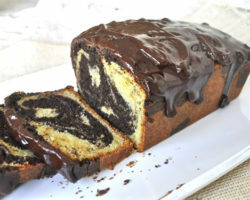 Bake at 350 degrees for about 10 to 15 minutes. They’re crinkly and taste kind of like parmesan cheese. 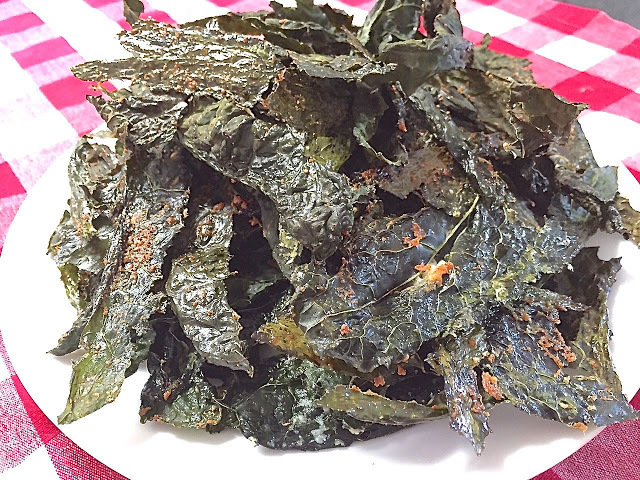 Without the cheese, I’m not sure I’d be sold on kale chips. But this platter disappeared quickly. The other kale dish that was a hit was this kale salad. You don’t need a bonafide recipe. Just chop some raw kale, add some corn shaved off the kernels (I cooked the cob for about three minutes first ), then I chopped some carrots and parboiled the bits for a few minutes. I added some red onion, toasted hazelnuts and chopped shishito peppers from my garden, but you could use red peppers or any vegetable you like. 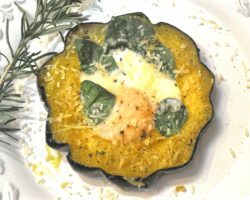 Parmesan cheese shavings were tossed in too, then the whole thing was mixed with an easy-to-make dressing of mayonnaise thinned with lemon juice – an idea I got from my buddy Marie, of Proud Italian Cook. It made a refreshing lunch and I didn’t have to feel guilty about that piece of cake I ate following the salad. Remove the casings from the sausage and place in a saucepan, covered with water. Simmer for about 15 minutes, then remove the sausage and slice, but retain the water for later use. In another pan, sauté the onion and garlic in the olive oil until softened. 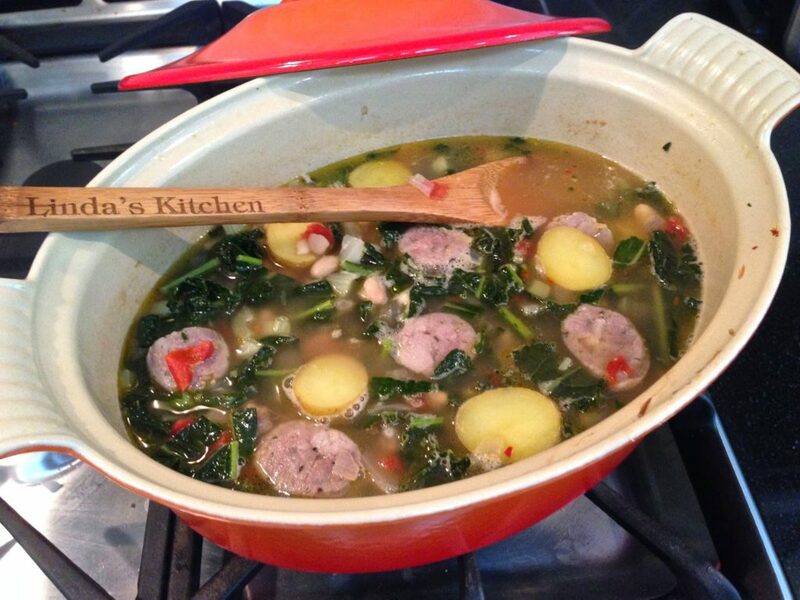 Add the kale to the pot and the water leftover from cooking the sausage. 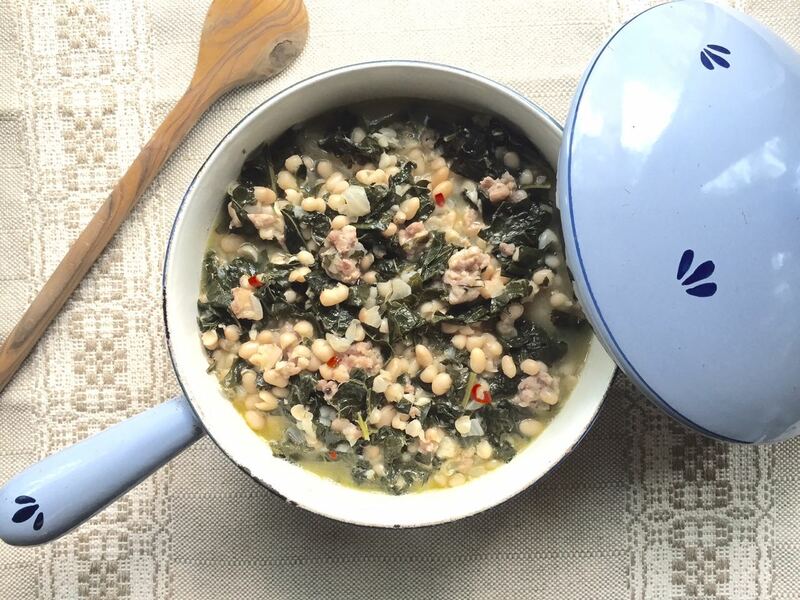 Let the kale cook down for about five minutes (with the lid on), then add the beans, the sausage, the water and the parmesan rind to the pot. Don’t add the salt yet, or the beans will toughen, but DO add the pepper, the herbs and the red pepper flakes. 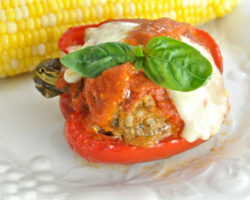 I sometimes add a small amount of chopped tomato and/or roasted red peppers. Let everything simmer with the lid on for about one hour, or until the beans are tender. Keep checking and add more water if necessary. When everything is cooked, add the salt. If it’s not “soupy” enough to your liking, add more water. 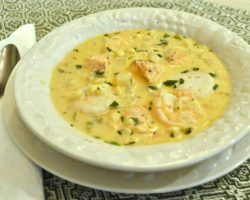 It’s great served with grilled bread that’s been rubbed with raw garlic and olive oil. 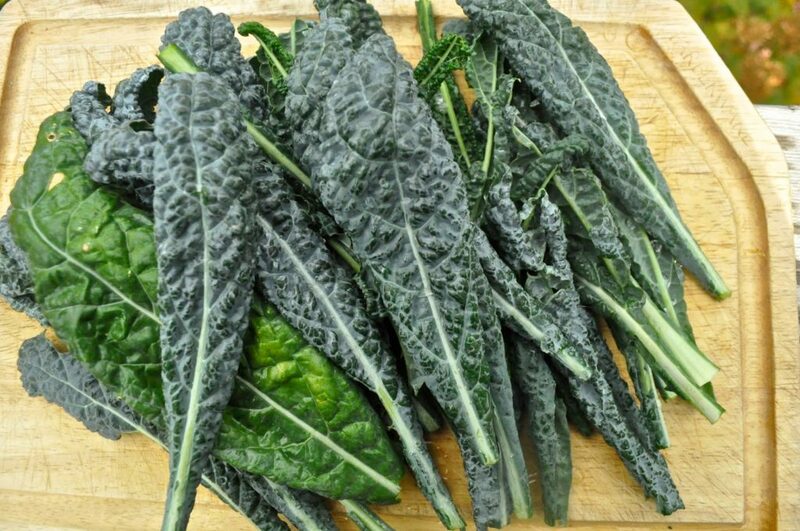 The kale I grow is lacinato kale, sometimes called dinosaur kale or cavolo nero in Italian, where it’s commonly used in ribollita. But you can use any kind of kale you’ve got, or use Swiss chard or spinach, for that matter. It all depends on your taste and what’s available to you. It’s ready to eat after about 45 minutes of cooking on the stove. 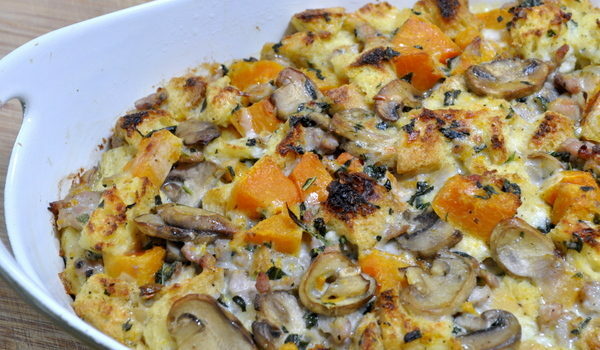 Add a couple of slices of bread and sit down to a satisfying, filling and nutritious meal. Now about that Le Creuset pot. Mine was discolored and more than 40 years old. After reading on Adri Barr Crocetti’s blog about how the company replaced her old, stained pot with a new one, I thought I’d contact them too. I did, and they replaced mine with the beauty you see above. (Merry Christmas!) They aren’t kidding when they say their product has a “lifetime limited warranty.” If you’ve got a discolored, but otherwise non-chipped or damaged Le Creuset pot and want to contact them, call the company’s toll-free number at 1-877-418-5547 or email them at Consumer-Services@LeCreuset.com. Sauté the sausage links in a pan smeared with a small bit of olive oil and cook through. Remove the sausage from the pot, add the 2 T. olive oil, the onion, celery and garlic and cook until softened. Slice the sausage and put it back in the pot, adding the wine. Bring to a boil and add the chicken broth and the rest of the ingredients. Let everything come to the boil, then reduce to a simmer and cook for about 45 minutes. Add another cup of water if the soup is too dense for you, or if you want to stretch it a bit. Remove the parmesan rind before serving. Want to get your new year off to a good start? No, I’m not talking about the umpteenth resolution to lose weight. I’m talking about lentils. They are traditionally eaten by many Italians on January 1 to augur a year of prosperity and good luck. You can enjoy this soup any time of the year, although it’s particularly welcome on a cold winter day, joined by a hunk of freshly baked bread straight out of the oven. 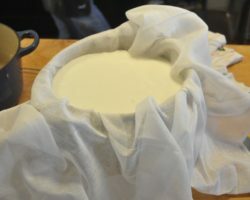 You did read yesterday’s post and run right out to get some yeast, right? Right. 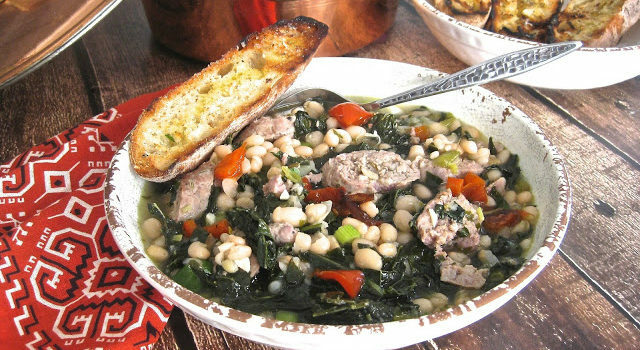 I use Italian sausage in this recipe – the kind you get when you order a sausage and pepper sandwich at any Italian street festival. 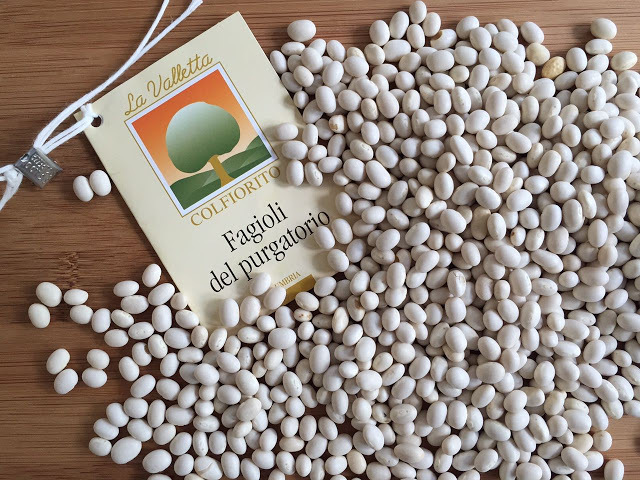 In Italy, lentils are served on New Year’s Day with a type of sausage called cotechino, or with zampone, a stuffed pig’s trotter. Neither is easy to find where I live, but truth be told, I don’t like either of them. 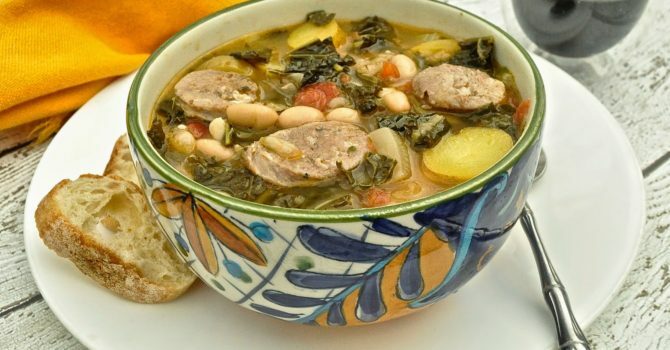 If you prefer, leave the sausage out entirely and make it a vegetarian soup. It will still be good, but not as rich in flavor. This makes a LOT of soup. 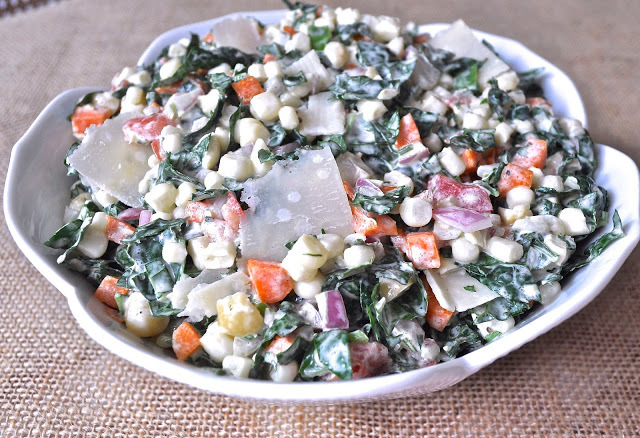 It would be perfect to invite a gang of friends for an informal meal and serve this with a salad and some cheese and crackers. Otherwise, it stores well in the freezer. Take the casing off the sausages and fry in a skillet, breaking up the links into bite-size pieces. Drain. Rinse the lentils in a colander. In a separate large pot, saute the onion, celery and garlic in the olive oil until translucent. 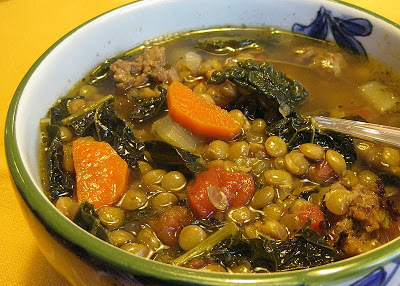 Add the lentils and the rest of the ingredients, including the drained sausage. Cook for 1 1/2 – 2 hours. You may need to add more water if the soup gets too thick. Adjust seasonings to taste and serve.